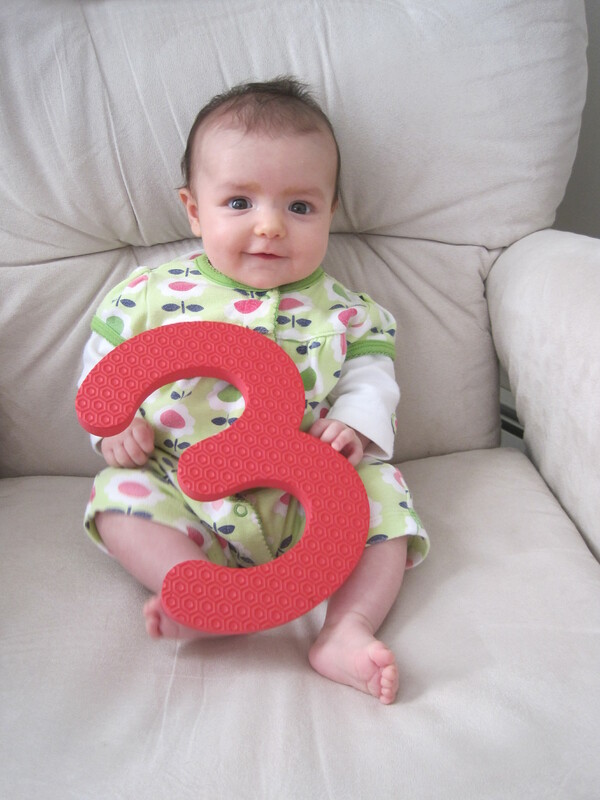 S is three months old! We don’t have another doctor’s appointment until she’s four months old and (knock on wood) we’ve not been in for a sick appointment lately, so I don’t know her weight. She’s sleeping great! Since I’ve been back to work this week she’s gone to bed around 8 or 8:30pm (and sometimes crabbed a little bit until 9pm or so) and then slept until around 4:30am three mornings and until 5am one morning. Since we have to get up about 5:15am for work, this is just about perfect! It’s made our mornings pretty relaxing since we’ve got so much time. I just need to get myself to bed earlier. She’s really starting to give us lots of smiles. She’s really into watching M. I can’t believe how great this little baby is and how fast she’s growing up! Wow, when did she turn into a little girl? Newborn phase is over! What a doll!